Opened in 1993, Guido's Premium Pizza is known as "The Savory Sauce Boss," and we have been voted best pizza at many of our locations! We offer three varieties of made fresh daily pizza sauce: SPICY FIRE ROASTED, CHUNKY TOMATO or our ORIGINAL RECIPE. The most popular items on the menu include "The Big G" a 16-piece Detroit Style deep dish pizza, and the local favorite "Da Boss" Guido's own version of a Chicago style pizza. Our made-to-order Stromboli is the most recent addition to the menu, with pasta, hot subs, salads and mozzarella bread as wonderful complements. Guido's Premium Pizza has 12 Michigan locations offering speedy delivery service and catering for parties, meetings and events. Guido's is open seven days a week for lunch and dinner. 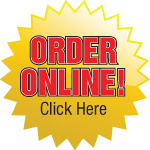 Call ahead or Order Online for carry-out or delivery service. Choose from thin crust, hand tossed or deep dish pizza. Each of our 12 Guido's Pizza locations offers different pizza specials and coupons for pizza delivery. Visit the "Coupons" page and click the location nearest you to find money-saving pizza coupons for your family. If you need something earlier or later than our established hours, just give us a call ahead of time and we will try to make arrangements to best serve you! To allow our employees to share the holidays with their families we are closed each year on Easter, Thanksgiving and Christmas.